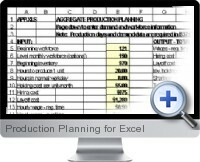 Excel Templates for Production Planning include: Aggregate production planning, Run-out time production planning, and Learning curves. Aggregate production planning is the process of determining (1) the timing and quantity of production, (2) the level of inventories, (3) the number of workers employed, and (4) the amount of overtime used for up to 12 months ahead. Production and inventories are stated in overall or aggregate quantities, such as number of automobiles without regard to model or color or number of pairs of shoes without regard to style or size. Cost minimization is rarely the only goal in aggregate planning. Other considerations, such as stability of the workforce and maintenance of adequate inventory levels, are usually just as important. The aim of the Run-out time production planning template is to give each inventory item the same run-out time, defined as the number of weeks the inventory will last at current demand rates. Of course, the demand forecasts change weekly, so run-out time is updated weekly. Management controls the model by specifying the number of hours to be worked next week on stock production. Other inputs include the item description, the production hours required to produce 1 unit, the inventory on-hand in units, and the demand forecast for the next week in units. The learning curve is a widely-used model that predicts a reduction in direct labor hours or costs per unit as cumulative production increases.